Getting here isn’t always easy—either you make the hop from San Jose on a tiny few-seater plane or you find yourself negotiating winding roads through the rain forest and fording rivers that sometimes make the way impassable. But then, paradise wouldn’t be paradise if it was next door. Waiting at the end of your journey is the revelation of Punta Islita, perched on a hilltop with a view of the Pacific that instantly makes all the effort worthwhile. And you haven’t even succumbed to its serenity and solitude yet. 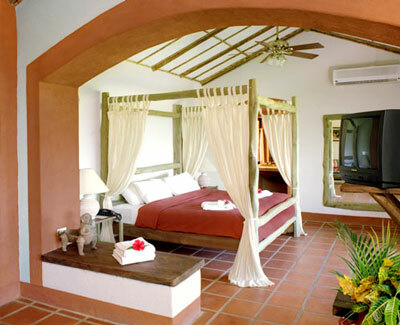 Each of its rooms, suites, and casitas is a haven of relaxed luxury, decorated with locally crafted furniture and brightened by splashes of color and tropical flowers. Canopy beds add a touch of romance in many, while amenities like air conditioning, direct TV, and coffeemakers make sure you don’t miss the comforts of home. But A/C may well be the furthest thing from your mind when you can drink in ocean views from the hammock or Jacuzzi® on your terrace, or maybe even from the private pool outside your own casita. Punta Islita is all about relaxation and rejuvenation, whether you’re cooling off in the freeform pool, sipping drinks in the thatched palapa at El Borrancho Beach Club, surrendering to a massage, or dining by candlelight in the open-air 1492 restaurant. But here you can also indulge in a surprising number of active pursuits, from a kayaking eco-safari to a treetop canopy excursion, surfing to horseback riding on the beach, plus shopping in a colorful open-air gallery in town that showcases local artists.